Dr. Sue Biggins, a new member of the Board of Scientific Advisors, was the first to isolate, reconstitute, and visualize kinetochores, key structures that holds chromosomes to microtubules during cell division and ensure daughter cells receive the correct number of chromosomes. How did you first become interested in the kinetochore? 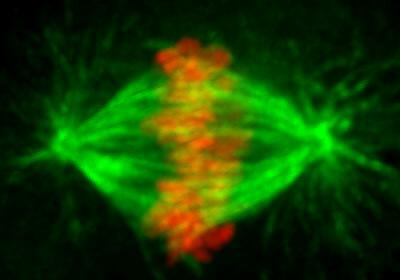 In college, I remember seeing pictures of mitosis that show microtubules capturing and pulling chromosomes, and I thought that cell division was all figured out. Later, as a JCC Fellow in Andrew Murray’s lab (then at UCSF), I was interested in his co-discovery of the spindle checkpoint, which is a mechanism that stops the cell cycle until all kinetochore – microtubule connections are hooked up correctly. I thought it was coolest thing. But I started to realize more and more that we didn’t really know much about the kinetochore, even though that seemed to be what the spindle checkpoint monitored. The more I realized what we didn’t know, the more obsessed I was with studying it. What was the environment like at UCSF? UCSF was a phenomenal place to be a post doc because there was a great seminar series and amazing labs all around. I felt like I had as much intellectual stimulation as I possibly could have had. Andrew was a great postdoc advisor, very creative, and he was the one who taught me to “go for it” even if other people say a project will be hard. And then you joined The Hutch in 2000? The Hutch is a very unique place. Even though it’s a cancer center, they’re very proud of basic science and support the idea that fundamental science moves things forward. We have a great basic sciences division, and I really feel that my colleagues here support me trying new things. How did you know it was the right time to work on the kinetochore? The kinetochore project was in the back of my mind for some time when a new student, Bungo Akijoshi arrived. When I met him, Bungo had come straight off the airplane from Japan to the Hutch – before he even found a place to live. I could tell he was super motivated, more than normal. What were the big turning points during the project? We knew from the mass spec and the Western blots that Bungo had purified the bulk of the kinetochore proteins (which is really complex – more than 50 different proteins in yeast and many times bigger than a ribosome) so I was pretty excited that he might have it. But we didn’t know it was functional until we collaborated with Chip Asbury’s lab and found it was active to bind to microtubules under tension. Knowing that this was very close to physiological was definitely a big moment. I’d say having great collaborators is one key to success. I’m a geneticist and my collaborator on this project, Chip Asbury at University of Washington, is a biophysicist. When we talk about a problem in biology, it’s really interesting to hear the two perspectives. Collaboration isn’t just about getting stuff done, it’s also about learning how to think in more ways. We’re using purified kinetochores to learn more about how the spindle checkpoint works, we’re pushing the structural work, and there’s still a ton to do on the biophysics of the kinetochore- microtubule attachment and to learn how tension stabilizes them. Do you have any advice for current post docs? I remember people telling me I wouldn’t get a job because I used yeast as a model system. People said I had to switch organisms. There is pressure to find most fundable project or the hottest area. But I think it’s really important to try to identify what the key questions are and then figure out a way to answer them.